When we decided to proceed with another planned breeding (Winter '08) the quest was on for the perfect match for our gorgeous "Lourdes". We FOUND her!!! The "gorgeous" UNIK De Lamico!! 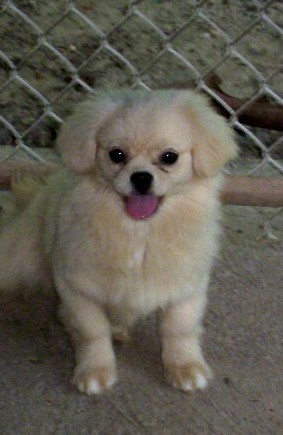 This perfect little lady with the beautiful cream coloring and white markings came to us from Europe!! She carries the VERY BEST of European bloodlines and we truly appreciate the efforts of our knowledgeable and dedicated fellow breeders overseas!! Her "call name" is TAFFY and what a dream girl she is!! "Taffy" is now AKC registered and CERF Certified and DNA Certified!! Her proportions are PERFECT; her color is BEAUTIFUL "Jersey CREAM" (correct black eyes and nose pigment); her movement is CORRECT (and our tibbies are know for their movement); and last, but not least, her temperament is "true tibbie": fun loving, regal and she has that "joie de vie"!! REMEMBER THIS GIRL!!! Unik De Lamico! !